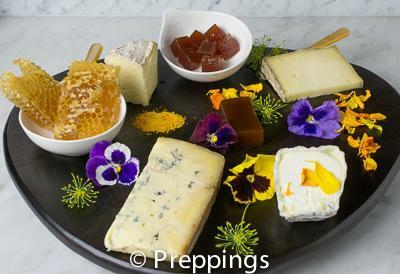 Are you creating a cheese plate and wanna stray away from the traditional accoutrements? The common garnishes usually found on a cheese plate are typically nuts, bread, crostini or crackers, dried fruit, and fresh fruit such as figs, grapes, apples and pears. Quince Paste – Sweet and gelatinous. This goes best with blue cheeses. Port Aspic- The classic pairing of port and blue cheese applies here. The sweet-tart flavor also goes well with hard Italian cheeses. Honeycomb – Sweet and crunchy. Serve with goat and soft Italian cheeses like ricotta. Citrus Powder – Tart and tangy and goes with mild goat cheeses and soft cheeses. Fennel Flower- Herbaceous and pungent, great with hard cheeses, especially sheep milk cheeses. Lemon Blossom- Citrus and floral flavor. Use with creamy soft cheeses. Edible Flowers- Adds a lot of color to the plate and has a mild floral flavor. Best with goat cheese and soft cheeses like Burrata.